Don’t let planning a large-group getaway to the Smokies throw you for a loop. Everything you need you’ll find at Summit View Lodge, where luxury meets comfort and the beauty of the mountains are all around. Summit View Lodge stands at the peak in the Great Smoky Mountains in Pigeon Forge, Tennessee, offering panoramic views from nearly every window in the cabin. Enjoy 9 bedrooms, 7 bathrooms, and updated living spaces for up to 30 guests. When it’s time to play, enjoy a separate theater room and rec room with a 60-game arcade, pool table, and foosball table. When it’s time to relax, enjoy an indoor jetted tub, two outdoor hot tubs, multiple decks with rocking chairs, and comfortable furniture throughout. 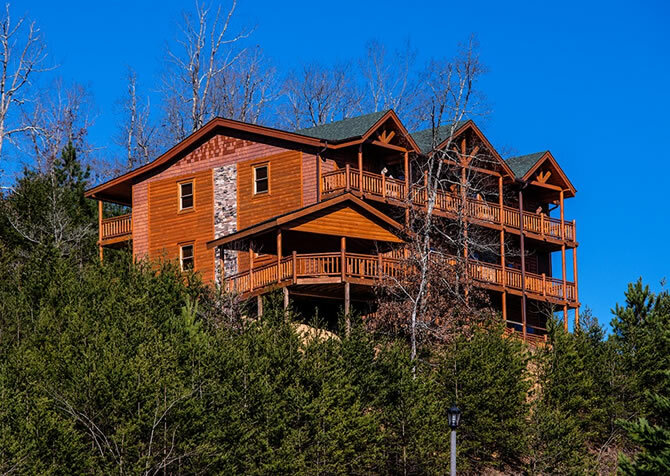 If you want to enjoy a night on the town with your crew, exciting attractions like Dollywood and Dolly Parton's Stampede are easily accessible from this Pigeon Forge cabin. But even on the days you have nothing planned, you’ll enjoy your Smoky Mountain getaway in this private, luxurious, secluded cabin in the Smokies. Open. Modern. Comfortable. These are just a few of the words that perfectly describe the living room of Summit View Lodge. Step into the main living space and enjoy multiple options for comfortable seating, including two oversized chairs and two couches. The furniture is two-tone, combining dark leather and suede for modern mountain appeal. Fixed as the focal point of the room is a large, stone-set gas fireplace—a perfect addition for those cool evenings on top of the mountain. This living space also comes with convenient features like end tables, a coffee table for games and drinks, and a large flat-creen TV that’s mounted above the fireplace. Gather your group to cheer for a favorite sports team or to play a group game like Catchphrase or Taboo in the living room of Summit View Lodge. Separate from the main living room is another smaller living space with a long couch, two chairs, and matching ottomans. If you want to have a separate place for the girls and the guys to hang out, or the adults and the kids, Summit View Lodge provides you with that option. 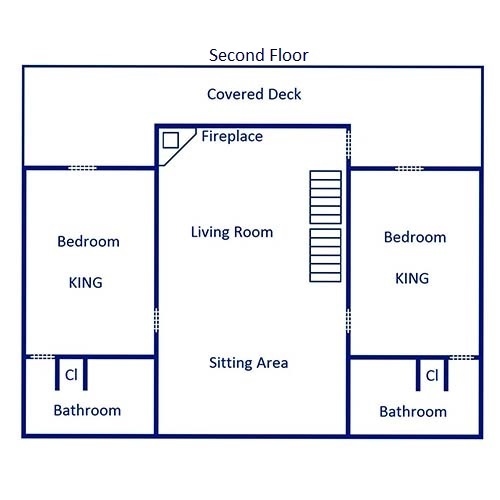 This is also a great space to use for guests playing board games, guests looking for a quiet nook to read, or guests wanting to chat in a more intimate space than the large living room of the main floor. For a 30-guest getaway, you’re going to need a decent-sized kitchen, and you’ll find exactly that at Summit View Lodge. The modern kitchen of this cabin comes with dark granite countertops, complementing light-colored cabinets, and black appliances. And you’ll be seeing double because this cabin comes with not one but TWO of every major appliance you’ll need while you’re away. Enjoy two refrigerators, two microwaves, two ovens, and even two dishwashers, providing you with plenty of space to make home-cooked meals while you’re in the mountains. Great options for breakfast include breakfast casseroles or packaged pastries. Lunch can be as easy as setting out a selection of bread, deli meats, and fixings. And dinner for a large group is easy as pie with simple soup recipes, favorite Italian recipes like lasagna, or a taco bar. You’ll understand why we recommend cooking in the cabin when you see the fantastic dining space that comes with Summit View Lodge. The wall of windows with mountain views that lines the back wall of the dining room just can’t be found in traditional downtown restaurants. Enjoy four rustic log tables, each with 6 coordinating chairs, providing you with enough seating for 20 in the main dining room. There’s also a bar area with stools attached to the kitchen and plenty of seating in the multiple living spaces found throughout Summit View Lodge. Another bonus feature of this cabin’s dining room is its fireplace and mounted flatscreen TV. If you’re looking for a place to gather your group for meetings or to watch a video, the dining room of Summit View Lodge is the perfect solution. 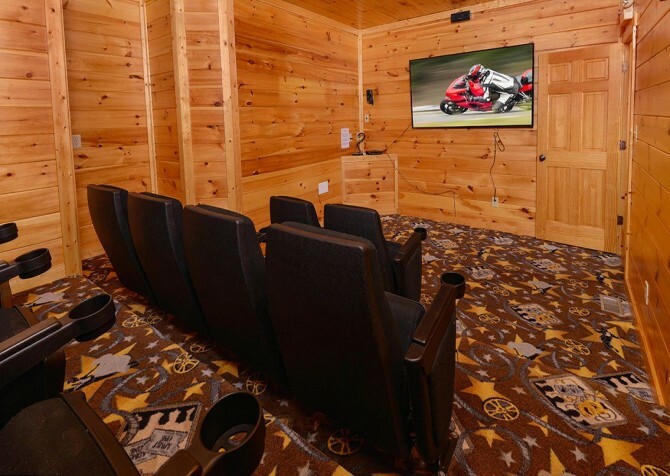 When it’s raining outside or you’re just looking for a fun way to spend the evening, try out the private theater room of Summit View Lodge! With 6 comfortable couches that can easily fit 2 a piece—and possibly 3 or 4, if you’re willing to cuddle!—you can fit a huge group in this theater room for a movie-watching experience like no other. The giant pull-down screen and projector will bring your favorite DVDs to life—like being at the theater without the steep ticket price! Pop some popcorn, mix your favorite drink, and get ready for a night with the gang that’s cozy and full of fun. Located on the top floor of the cabin, the rec room of Summit View Lodge comes fully loaded with everything your group needs to have a great time. Enjoy a 60-game arcade, a pool table, and a foosball table in this space. 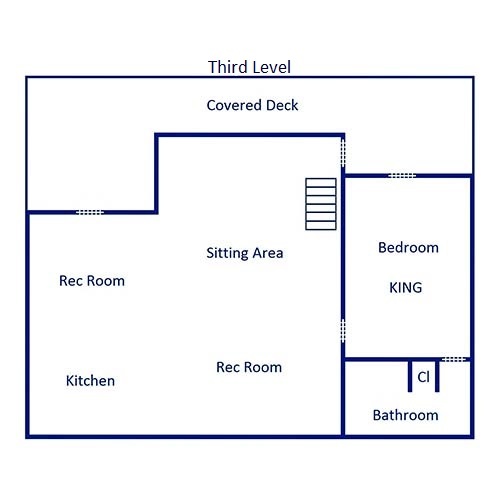 Also for your entertaining pleasure, this rec room comes with 3 flatscreen TVs—you can watch all your favorite shows at once! A sitting area in the middle of the rec room has two large couches, matching ottomans, and a large coffee table, where you can lay out your favorite snacks or play a game of cards. Or you can play at one of 2 separate tables in the rec room—either a card table complete with four chairs or a pub-style table found against the opposite wall. If you get hungry or thirsty while having fun in the rec room, no need to go downstairs. This space comes with its own full-size kitchen, including a refrigerator, sink, and microwave. There’s also a bar area with stools, so several guests can play pool or watch the game from the sidelines without overcrowding the space. And one of the best features of the rec room is its wall of windows across the back wall. Enjoy unbeatable mountain views while you hang out and have fun with friends and family in Summit View Lodge. To comfortably accommodate 30 guests, Summit View Lodge comes with 9 bedrooms and 7 bathrooms, all of which feature the modern mountain décor found throughout the cabin. Inside every bedroom you’ll find a flatscreen TV, familiar items from home like bedside tables and reading lamps, and cozy bedding. 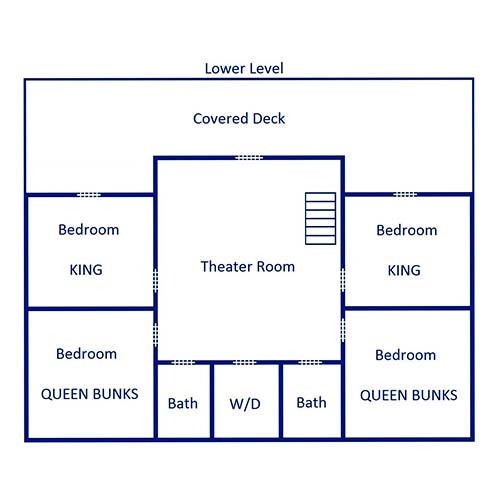 In some bedrooms you’ll even find special add-ons like an indoor jetted tub and direct porch access. 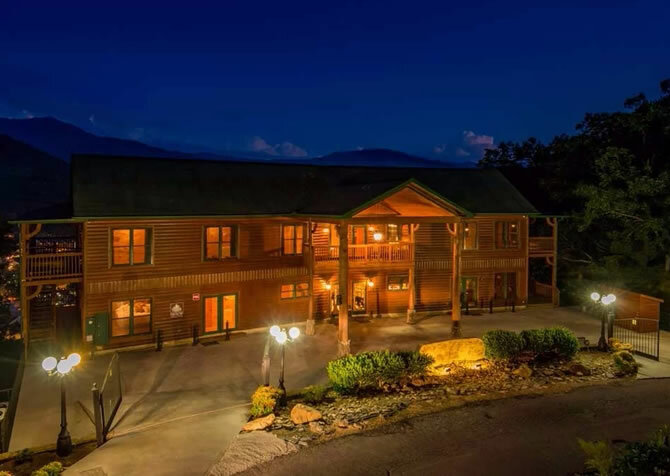 Look forward to a good night’s rest while you’re in the Smokies when you stay at Summit View Lodge. To take advantage of the gorgeous mountain views this cabin has to offer, be sure to spend some time on the multiple decks of Summit View Lodge. 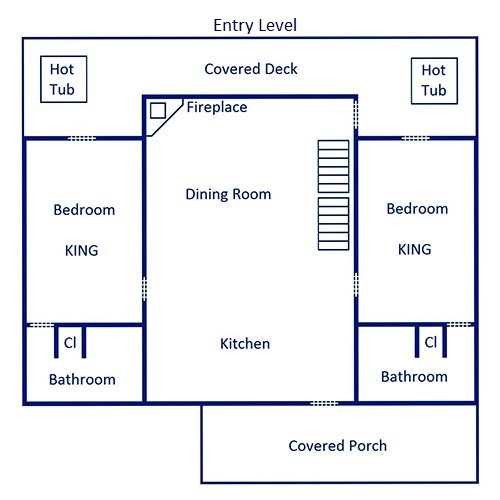 Each deck has something unique to offer—from a line of rocking chairs to multiple outdoor hot tubs to a charcoal grill. 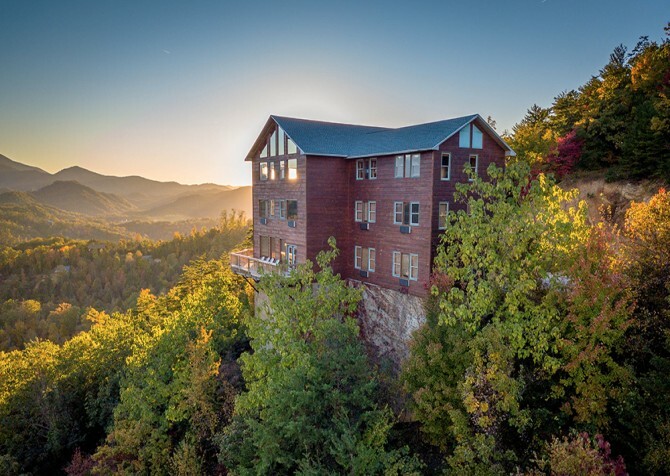 Whatever you have planned for your Smoky Mountain getaway, you’ll love to hang out with your group, sipping a favorite glass of Smoky Mountain wine and soaking in the amazing views from the top of the Smokies. As if the variety of game tables, double outdoor hot tubs, and a private theater room weren’t enough, Summit View Lodge continues to impress with little extras like high speed, wireless Internet access; a Blu-ray, DVD, and VHS player; and a washer and dryer. You never know when these items might come in handy during your time away, so we like to make sure you have access to them at Summit View Lodge. We want your getaway to bring you the best of luxurious mountain living and a comfortable, home-like atmosphere. Less than 5 miles from Summit View Lodge is one of the most popular attractions in the South. Dollywood has everything from world-class roller coasters and state-of-the-art musical productions to delicious Southern fare. If you’re looking for a unique way to spend the evening with your large group, head over to Dolly Parton's Stampede, located less than 6 miles from Summit View Lodge. Enjoy good ole Southern cooking and a boot-stompin’ good time at this rodeo show like no other. The perfect way to please a picky group is to give them lots of options. And you’ll find plenty at one of Pigeon Forge’s newest attractions, The Island. With a variety of things to see, ride, taste, and experience, this all-inclusive attraction is sure to be a hit! "Summit View Lodge met or exceeded all of our expectations. A wonderful place to get together with family or friends, this cabin made it super easy for our group to relax and enjoy each other’s company. Good amenities—we had a blast!"